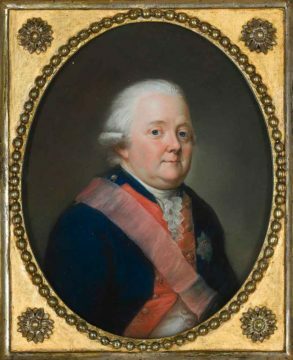 In 1776, Knyphausen came to America as second-in-command of an army of 12,000 men called “Hessians” under General Leopold Philip de Heister. Knyphausen led the Hessian troops at White Plains, Fort Washington, Brandywine, Germantown, Springfield, and Monmouth. In 1779 and 1780, he commanded British-held New York City. When Heister left for Germany, Knyphausen took command of the German troops serving under General William Howe. Because of Knyphausen's seniority, British officers held dormant commissions outranking him in case the British commander became disabled. Despite this, Knyphausen was trusted by his British superiors. Knyphausen's regiment took part in the attack on Fort Washington and was in garrison at Trenton, New Jersey. Howe gave Knyphausen responsibility for commanding the right flank at Brandywine. He also commanded the vanguard of the army withdrawing from Philadelphia at the time of the Battle of Monmouth. For several years, the main body of Knyphausen's force occupied the upper part of Manhattan Island, and during the temporary absence of Sir Henry Clinton in 1780, he was in command of the city. Knyphausen left the North American theater in 1782 in part because of ill health, including blindness in one eye caused by a cataract. In 1775, before the American War of Independence broke out, he led troops to Salem, Massachusetts looking for contraband weapons. His advance was delayed by a standoff at a bridge, during which the colonists removed the weapons he was looking for. His force was eventually allowed to proceed, but found nothing of consequence, and was received with hostility during the expedition. In 1776, Leslie was promoted to brigadier-general. He fought in the Battle of Long Island, the Landing at Kip's Bay, the Battle of White Plains and the Battle of Harlem Heights, the Battle of Princeton and the Siege of Charleston during the American War of Independence. At Princeton, his nephew, Captain William Leslie was mortally wounded. In 1780, he was sent to the Chesapeake Bay by Sir Henry Clinton in order to "make a powerful diversion in [Earl Cornwallis's] favor by striking at the magazines then collecting by the enemy ... for supplying the army they were assembling to oppose him." He became major general in 1782 and was made Colonel of the 63rd (West Suffolk) Regiment of Foot the same year. Promoted to lieutenant general in North America, Cornwallis began his service in 1776 under General Henry Clinton with the failed Siege of Charleston. He and Clinton then sailed for New York City, where they participated in General William Howe's campaign for New York City. Cornwallis was often given a leading role during this campaign; his division was in the lead at the Battle of Long Island, and he chased the retreating George Washington across New Jersey after the city fell. On January 2, 1777, Cornwallis advanced on Trenton, to the Assunpink Creek. He was unable to dislodge General George Washington in the battle that followed. Cornwallis spent the winter in New York and New Jersey, where the forces under his command were engaged in ongoing skirmishes with the Americans. Cornwallis continued to serve under Howe on his campaign for control of Philadelphia. Cornwallis led the flanking maneuver at the Battle of Brandywine, and played key roles at Germantown and Fort Mercer. In 1778, Cornwallis was made second in command. When Philadelphia was abandoned. Cornwallis commanded the rearguard during the overland withdrawal to New York City and played an important role in the Battle of Monmouth. In November 1778, Cornwallis returned to England. Cornwallis returned to America in July 1779, where he was to play a central role as the lead commander of the British "Southern strategy". At the end of 1779, Clinton and Cornwallis transported a large force south and initiated the second siege of Charleston during the spring of 1780, which resulted in the surrender of the Continental forces under Benjamin Lincoln. After the siege of Charleston and the battle at Waxhaw, Clinton returned to New York, leaving Cornwallis in command in the south. In August 1780, Cornwallis' forces routed the Americans at Camden. This served to keep South Carolina clear of Continental forces, and was a blow to rebel morale. Cornwallis optimistically began to advance north into North Carolina while militia activity continued to harass the troops he left in South Carolina. He then clashed with the rebuilt Continental army at Guilford Court House. Believing that North Carolina could not be subdued unless its supply lines from Virginia were cut, he decided to join forces with General William Phillips in Virginia. Under orders, Cornwallis eventually moved his forces to Yorktown. During the siege of Yorktown, he surrendered after about three weeks to Washington. Cornwallis, apparently not wanting to face Washington, claimed to be ill on the day of the surrender, and sent Brigadier General Charles O'Hara in his place to surrender his sword formally. Washington had his second-in-command, General Benjamin Lincoln, accept Cornwallis' sword. Cornwallis returned to Britain with Benedict Arnold and they landed in Britain on January 21, 1782. Because he was released on parole, Cornwallis refused to serve again until the war came to an end in 1783. Grey was one of the more successful British army leaders in the war. He was rapidly promoted, becoming a Major General in 1777 and commanded the 3rd Brigade at the Battle of Brandywine. He earned the nickname "No-flint Grey" after the Battle of Paoli in 1777 when, to ensure surprise in a night attack on an American encampment, he ordered the infantry of his command to remove the flints from their muskets and use only their bayonets. He commanded the 3rd Brigade again at the Battle of Germantown and the Battle of Monmouth. In 1778, he led raids at New Bedford on September 5-6 and Martha's Vineyard, where between September 10-15. 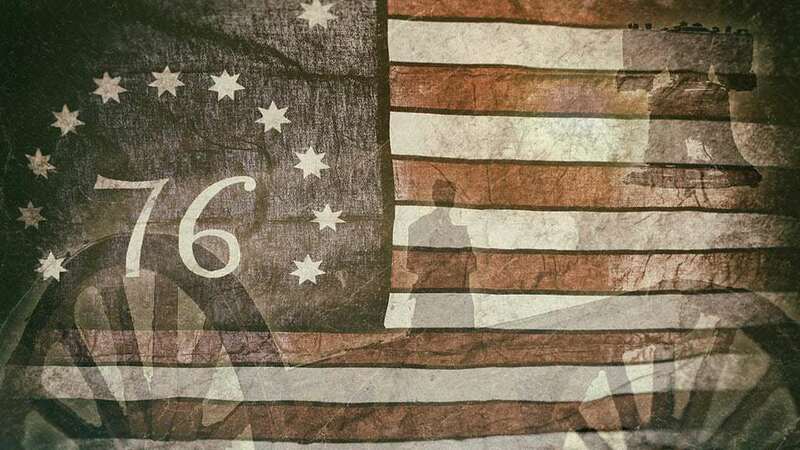 On September 27, 1778, Grey used the same methods as he had at the Battle of Paoli in a controversial night attack at Old Tappan, New Jersey, which came to be known as the Baylor Massacre. He was recalled to England and became a knight of the Order of the Bath and a lieutenant general. He later was appointed commander-in-chief of the British troops in America, but hostilities ended before he could take command. In 1776, the British government began to sign treaties to with various German princes to supply units to aid in the American War of Independence. The Duke of Brunswick signed a treaty to provide 4,000 foot soldiers and 350 heavy dragoons. On March 18, they sailed from Stade with the newly promoted Major General Riedesel as their commander. After a stop over in England, they arrived in Quebec City on June 1. They supported the final expulsion from Canada of the American forces during the invasion of Canada. They were then distributed for the winter through various posts in Canada. Riedesel was put in command of all German and American Indian forces during the Saratoga campaign of 1777. His letters to the Duke of Brunswick reveal discontent with British Generals John Burgoyne and William Howe. Riedesel was captured when General John Burgoyne surrendered after the Battle of Saratoga in 1777. He was imprisoned with the Convention Army in Charlottesville, Virginia. He was transferred to New York, where he spent a year on parole, before being exchanged for American General William Thompson. 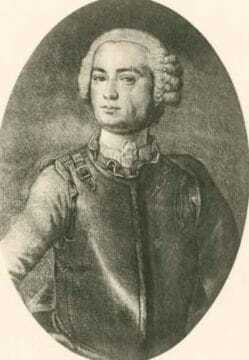 The Baron commanded troops on Long Island in Winter 1780-81. In 1781, Quebec governor Frederick Haldimand named Riedesel officer in charge of the Sorel District, where he and his family stayed until his departure from North America at the end of Summer 1784. With the outbreak of the Revolutionary War, Collier was dispatched to the North American station, where he performed a number of successful services that led to the conferring of a knighthood in 1775. He was then appointed commander of the 44-gun 4th-Rate Ship HMS Rainbow and sailed for North America in May 1776. Upon his return to the American colonies, Collier provided support for General William Howe's landing at Long Island, New York on August 22, 1776. Sent to Halifax, Nova Scotia as a senior officer by Admiral Richard Howe, Collier captured the American 32-Gun Frigate USS Hancock on July 8, 1777 after a long chase. Collier followed up on his success the following month by destroying supplies at Machias, Maine, thereby ruining American plans for an invasion of Nova Scotia. Collier remained at Halifax until called upon to succeed the departing Admiral James Gambier as commodore and acting commander-in-chief of the North American Station on April 4, 1779. Collier duly moved to New York City and hoisted his flag aboard the 64-gun HMS Raisonnable. The strength of his squadron had been drastically reduced by the departure of many of the ships to join the fleets of John Byron and William Hotham in the West Indies. Nevertheless, Collier organised and carried out he highly successful Chesapeake raid on the Virginia coast with General Edward Mathew commanding the army contingent. Anchoring his ships in Hampton Roads on May 9, he landed 2,000 British troops and spent the next fortnight destroying ships and supplies for the Colonial army. They encountered no serious opposition, and returned to New York having destroyed over $1 million worth of supplies. On May 30, Collier joined the British assault on Stony Point, New York providing support for Sir Henry Clinton, sinking an American ship. One of the few naval commanders able to get along with Clinton, Collier also provided naval support for William Tryon's raid of Connecticut ports in July before returning to New York in late-August. During this time, he learnt that the Americans had carried out a combined land and sea assault on a recently established British outpost on Penobscot Bay. Collier gathered his forces and rushed to the scene in his flagship, supported by four frigates. He was unable to attack as soon as he arrived, being forced to wait for daylight to advance up the river. By the time he moved into the harbour, the Americans had re-embarked men and stores and withdrawn up the river. Collier gave chase, eventually forcing the Americans to burn their ships and flee into the woods. Four armed vessels nevertheless fell into Collier's hands, while the American fleet of 19 armed and 24 provision and transport vessels was destroyed. This decisively defeated the largest rebel naval force of the war. Replaced as commander-in-chief by Admiral Mariot Arbuthnot while at sea, Collier was recalled to Great Britain. He sailed home aboard HMS Daphne, and arrived in Portsmouth on November 29, 1779. He assumed command of the 74-gun HMS Canada early in 1780. He commanded her in the English Channel, and participated in the relief of Gibraltar on April 12, 1781 with Vice-Admiral George Darby's force. While returning to England, Collier fell in with and after a short engagement captured the 44-gun Spanish frigate Leocadia. On his return, he resigned his commission, having had some falling out or disagreement with the government, or the First Lord of the Admiralty Lord Sandwich. Carleton received notice of the start of the rebellion in May 1775, soon followed by the news of the rebel capture of Fort Ticonderoga and Fort Crown Point, and the raid on Fort Saint-Jean. As he had previously sent two of his regiments to Boston, he had only about 800 regular soldiers left in Quebec. His attempts to raise a militia met with limited success at first, as neither the ethnic French nor the English residents were willing to join. During the summer of 1775, Carleton directed the preparation of provincial defences, which were focused on Fort Saint-Jean. In September, the Continental Army began its invasion and besieged the fort. When it fell in November, Carleton was forced to flee from Montreal to Quebec City, escaping capture by disguising himself as a commoner. In December 1775, he directed the city's defenses in the Battle of Quebec and the ensuing siege, which was broken by the arrival of British troops in May 1776 under command of John Burgoyne, who was appointed Second-in-Command. Carleton launched a counteroffensive against the rebels, which included repelling an attempted attack on Trois-Rivières. In June 1776, he was appointed a Knight of the Bath. The next month Carleton commanded British naval forces on the Richelieu River, culminating in the Battle of Valcour Island on Lake Champlain in October 1776 against a rebel fleet led by General Benedict Arnold. The British, with a significantly superior fleet, won a decisive victory, destroying or capturing most of the rebel fleet, but the delay prevented Carleton from continuing on to capture Fort Ticonderoga that year. His brother Thomas and nephew Christopher both served on his staff during the campaign. The morning following the battle, a small island in Lake Champlain was named Carleton's Prize, perhaps to Carleton's embarrassment at the time. 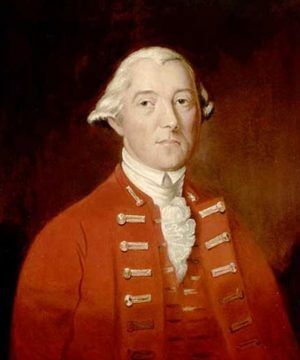 In 1777, command of the major northern expedition to divide the rebel colonies was given to General John Burgoyne. Upset that he had not been given its command, Carleton asked to be recalled. He was replaced as governor and military commander of Quebec in 1778 by Frederick Haldimand, and returned to England. In 1780, he was appointed by Prime Minister Lord North to a commission investigating public finances. This post he held until 1782, when General Sir Henry Clinton was recalled in the aftermath of the 1781 surrender at Yorktown. Carleton was appointed to replace Clinton as a military commander-in-chief of the war effort. In August 1783, Carleton was informed that Great Britain would grant the United States its independence. With his exit from New York imminent, Carleton asked to be relieved of his command. With this news, Loyalists began an exodus from the Thirteen Colonies and Carleton did his best to have them resettled outside the United States. Clinton was sent with British reinforcements to strengthen their position in Boston. He arrived on May 25, having learned en route that the American War of Independence had broken out, and that Boston was under siege. After the victory at the battle of Bunker Hill, Clinton famously wrote of the battle that it was "A dear bought victory, another such would have ruined us." In January 1776, Clinton sailed south with a small fleet and 1,500 men to assess military opportunities in the Carolinas. Clinton's troops were landed on an island near Sullivan's Island. The attack was reduced to a naval bombardment, which failed. Clinton rejoined the main fleet to participate in General William Howe's August 1776 assault on New York City. Clinton participated in the battles at Kip's Bay, Long Island, and White Plains. In November, he occupied Newport, Rhode Island. In July 1777, Clinton was left to hold New York during the campaign season. Clinton was formally appointed to the post of Commander-in-Chief for North America on February 4, 1778. Word of this did not arrive until April, and Clinton assumed command in Philadelphia in May 1778. France had by this time formally entered the war on the American side. Clinton was consequently ordered to withdraw from Philadelphia and send 5,000 of his troops to the economically important Caribbean. For the rest of the war, Clinton received few reinforcements as a consequence of the globalization of the conflict. His orders were to strengthen areas of North America that were firmly under British control, and do no more than conduct raiding expeditions in the Patriot-controlled areas. Owing to a shortage of transports for all of the Loyalists fleeing Philadelphia, Clinton acted against his direct orders and decided to move the army to New York by land instead of by sea. He conducted a skillful march to New York and fought a standoff battle at Monmouth Court House. With the 1778 campaign season closed, Clinton considered options for action in 1779. Clinton ordered two major raiding expeditions, one against Connecticut, the other against Chesapeake Bay, while Washington detached troops to deal with the increasing frontier war, which was primarily orchestrated from Quebec. After the Chesapeake raid Clinton drove the Americans from a key crossing of the Hudson River at Stony Point, New York. Stony Point was retaken by the Americans after Clinton weakened its garrison to supply men for the Connecticut raids. On June 30, 1779, Clinton issued what has become known as the Philipsburg Proclamation. This institutionalized in the British Army an offer of freedom to enlisted runaway slaves. He justified this offer by citing the fact that the Continental Army was also actively recruiting African Americans. The proclamation led to a flood of fugitive slaves making their way to British lines, and the issue of slave repatriation would complicate Anglo-American relations as the war was ending. The French besieged Savannah, Georgia with American assistance, and failed disastrously in the attempt. This convinced Clinton that an expedition against South Carolina held promise. He began to assemble a force an expedition to take Charleston, withdrawing the forces from Newport for the purpose. He took personal command of this campaign, and the task force with 14,000 men sailed south from New York at the end of the year. By early 1780, Clinton had brought Charleston under siege, forcing it's surrender in May. From New York, he oversaw the campaign in the South. In 1782, after fighting in the North American theater ended with the surrender of Cornwallis at Yorktown, Clinton was replaced as Commander-in-Chief by General Guy Carleton, and he returned to England. On the outbreak of the American war, he was appointed to a command, and arrived in Boston in May 1775, a few weeks after the first shots of the war had been fired. He participated as part of the garrison during the Siege of Boston, although he did not see action at Bunker Hill. Frustrated by the lack of opportunities, he returned to England. In 1776, he was at the head of the British reinforcements that sailed up the Saint Lawrence River and relieved Quebec City, which was under siege by the Continental Army. He led forces under General Guy Carleton in the drive that chased the Continental Army from the province of Quebec. Carleton then led the British forces onto Lake Champlain, where he failed to attempt the capture of Fort Ticonderoga after winning the naval Battle of Valcour Island. In 1777, Burgoyne was given command of the British forces charged with gaining control of Lake Champlain and the Hudson River valley. The plan would divide New England from the southern colonies, and, it was believed, make it easier to end the rebellion. As a result of miscommunication, Burgoyne ended up conducting the campaign single-handedly. He was not yet aware that he would not be gaining additional support, and was still reasonably confident of success. Burgoyne was also led to believe by reports that he could rely on the support of large numbers of Native Americans and American Loyalists who would rally to the flag once the British came south. The campaign was initially successful. Burgoyne gained possession of the vital outposts of Fort Ticonderoga (for which he was made a lieutenant-general) and Fort Edward, but, pushing on, decided to break his communications with Quebec, and was eventually hemmed in by a superior force led by American Major General Horatio Gates. Several attempts to break through the enemy lines were repulsed at Saratoga in September and October 1777. On October 17, 1777, Burgoyne surrendered his entire army. This was the greatest victory the colonists had yet gained, and it proved to be the turning point in the war. Following Saratoga, the indignation in Britain against Burgoyne was great. He returned to England at once to defend his conduct and demanded but never obtained a trial. Following the defeat, France recognized the United States and entered the war on February 6, 1778, transforming it into a global conflict. The expedition from Cork, Ireland, with Campbell and his force, arrived off the coast of Cape Fear, North Carolina in April and May 1776. It then moved to attack Charleston, South Carolina from the sea. He was involved at Sullivan's Island, although his unit avoided direct action. He was then redeployed to Staten Island, New York on July 21. Next, he was at the battles at Long Island, Paulus Hook, Fort Montgomery, and the raid on Egg Harbor. Shortly after the 57th's return to New York City, Campbell was promoted to Brigadier General and transferred to a staff command. 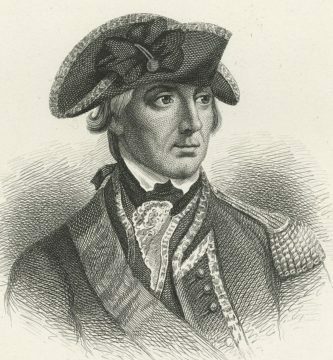 In October 1778, Campbell received a communication from Lord George Germain to proceed to Pensacola in the Province of West Florida and take command of the British troops there. On February 19, 1779, Campbell was promoted Major General, and on March 22, he was given complete authority over all troops in the Province of West Florida. On June 21, 1779, Spain declared war on Britain. Unfortunately for Campbell, Bernardo de Gálvez, the governor of Spanish Louisiana, also received an intercepted copy of the secret letter to organize an attack on New Orleans. On September 11, 1779, Gálvez led a Spanish force and their Indian allies marched against British forts on the lower Mississippi, capturing Fort Bute and Fort New Richmond at Baton Rouge. Because they successfully interfered with British communications, Gálvez secured the surrender of most of western West Florida before Campbell was aware of it. On March 14, 1780, Fort Charlotte and Mobile capitulated to Spanish forces. When Campbell's scouts reported the display of Spanish colors over the fort, Campbell turned back to Pensacola, returning on March 18, 1780. With the surrender of Mobile, West Florida was reduced to the District of Pensacola alone. Early in March 1781, the long-awaited Spanish attack on Pensacola began. On March 21, Campbell made a humane proposal to Gálvez that the town and garrison of Pensacola should be spared. Campbell inspired his troops to defend Fort George. However, without naval protection nor adequate artillery to engage a counter assault, the Spanish artillery fire breached the ramparts on May 8, and struck a powder magazine. A powerful flotilla of warships neutralized outer British defenses and began an amphibious siege of the town on May 9. Campbell surrendered Fort George the next day. Under generous terms, Gálvez allowed the British troops, including Campbell, to return to New York. Campbell remained in British-held New York City until the British left under the Treaty of Paris on Evacuation Day, November 25, 1783. In 1783, he replaced General Guy Carleton as Commander-in-Chief, North America, a post he held until 1787. In 1775, Brant was appointed departmental secretary with the rank of Captain for the new British Superintendent's Mohawk warriors from Canajoharie. In April, he moved to the Province of Quebec, arriving in Montreal on July 17. On November 11, General Guy Johnson took Brant with him to London to solicit more support from the British government. Brant returned to Staten Island, New York in July 1776. Although the details of his service that summer and fall were not officially recorded, Brant was said to have been at the Battle of Long Island. In July 1777, the Six Nations council decided to abandon neutrality and enter the war on the British side. Brant was involved the the Siege of Fort Stanwix and played a major role in the Battle of Oriskany. In April 1778, Brant returned to Onoquaga. He became one of the most active partisan leaders in the frontier war. He and his Volunteers raided rebel settlements throughout the Mohawk Valley. On May 30, he led an attack on Cobleskill and in September, he led a mixed force of Indians and Loyalists in a raid on German Flatts. Brant's fame grew as a guerilla leader. In the Battle of Wyoming in July, the Seneca were accused of slaughtering noncombatant civilians. Although Brant was suspected of being involved, he did not participate in that battle, which nonetheless gave him the unflattering epithet of "Monster Brant". In October 1778, Continental soldiers and local militia attacked Brant's home base at Onaquaga while his Volunteers were away on a raid. In November, Brant joined his Mohawk forces in the Cherry Valley massacre. The Patriot Americans believed that Brant had commanded the Wyoming Valley massacre of 1778, and also considered him responsible for the Cherry Valley massacre. In February 1779, Brant traveled to Montreal to meet with Frederick Haldimand, the military commander and Governor of Quebec. 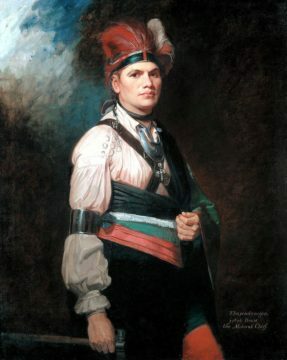 Haldimand commissioned Brant as Captain of the Northern Confederated Indians. Over the course of a year, Brant and his Loyalist forces had reduced much of New York and Pennsylvania to ruins. As Brant's activities were depriving the Continental Army of food, General George Washington ordered General John Sullivan in June 1779 to invade Kanienkeh and destroy all of the Haudenosaunee villages. In early July 1779, the British learned of plans for a major American expedition into Iroquois Seneca country. To disrupt the Americans' plans, John Butler sent Brant and his Volunteers on a quest for provisions and to gather intelligence in the upper Delaware River valley near Minisink, New York. Brant attacked and defeated American militia at the Battle of Minisink on July 22. In the Sullivan Expedition, the Continental Army sent a large force deep into Iroquois territory to attack the warriors and, as importantly, destroy their villages, crops and food stores. Brant's Volunteers harassed, but were unable to stop Sullivan who destroyed everything in his path, burning down 40 villages and 160, 000 bushels of corn. Brant and the Iroquois were defeated on August 29, 1779 at the Battle of Newtown, the only major conflict of the expedition. In early 1780, Brant resumed small-scale attacks on American troops and white settlers the Mohawk and Susquehanna river valleys. In February 1780, he and his party set out, and in April attacked Harpersfield. In mid-July 1780, Brant attacked the Oneida village of Kanonwalohale. On Brant's and his raiders' return up the valley, they divided into smaller parties, attacking Schoharie, Cherry Valley, and German Flatts. Joining with Butler's Rangers and the King's Royal Regiment of New York, Brant's forces were part of a third major raid on the Mohawk Valley, where they destroyed settlers' homes and crops. In August 1780, during a raid with the King's Royal Regiment of New York in the Mohawk valley, about 150, 000 bushels of wheat were burned. Brant was wounded in the heel at the Battle of Klock's Field. In April 1781, Brant was sent west to Fort Detroit to help defend against George Rogers Clark's expedition into the Ohio Country. In August 1781, Brant soundly defeated a detachment of Clark's force, ending the American threat to Detroit. He was wounded in the leg and spent the winter 1781–82 at the fort. During 1781 and 1782, Brant tried to keep the disaffected western Iroquois nations loyal to the Crown before and after the British surrendered at Yorktown in October 1781. In June 1782, Brant and his Indians went to Fort Oswego, where they helped rebuild the fort. In July 1782, he and 460 Iroquois raided Fort Herkimer and Fort Dayton, but they did not cause much serious damage. By 1782, there was not much left to destroy in New York and during the raid Brant's forces killed 9 men and captured some cattle. Sometime during the raid, he received a letter from Governor Haldimand, announcing peace negotiations, recalling the war party and ordering a cessation of hostilities. Brant denounced the British "no offensive war" policy as a betrayal of the Iroquois and urged the Indians to continue the war, but they were unable to do so without British supplies. In May 1783, a bitter Brant when he learned about the treaty of Paris wrote "England had sold the Indians to Congress". The American War of Independence was the culmination of the civil and political American Revolution resulting from the American Enlightenment. Brought to a head over the lack of American representation in Parliament, which was seen as a denial of their rights as Englishmen and often popularly focused on direct taxes levied by Parliament on the colonies without their consent, the colonists resisted the imposition of direct rule after the Boston Tea Party. Creating self-governing provinces, they circumvented the British ruling apparatus in each colony by 1774. Armed conflict between British regulars and colonial militiamen broke out at the Battles of Lexington and Concord in April 1775. After petitions to the Crown for intervention with Parliament were ignored, the rebel leaders were declared traitors by the Crown and a year of fighting ensued. The colonies declared their independence in July 1776, listing grievances against the British king and legislature while asking the support of the populace. Among George's other offences, the Declaration charged, "He has abdicated Government here ... He has plundered our seas, ravaged our Coasts, burnt our towns, and destroyed the lives of our people." The gilded equestrian statue of George III in New York was pulled down. The British captured the city in 1776, but lost Boston, and the grand strategic plan of invading from Canada and cutting off New England failed with the surrender of the British Lieutenant General John Burgoyne at the Battle of Saratoga. 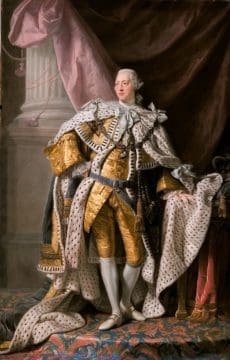 George III is often accused of obstinately trying to keep Great Britain at war with the revolutionaries in America, despite the opinions of his own ministers. In the words of the Victorian author George Trevelyan, the King was determined "never to acknowledge the independence of the Americans, and to punish their contumacy by the indefinite prolongation of a war which promised to be eternal." The King wanted to "keep the rebels harassed, anxious, and poor, until the day when, by a natural and inevitable process, discontent and disappointment were converted into penitence and remorse". However, more recent historians defend George by saying in the context of the times no king would willingly surrender such a large territory, and his conduct was far less ruthless than contemporary monarchs in Europe. After Saratoga, both Parliament and the British people were in favor of the war; recruitment ran at high levels and although political opponents were vocal, they remained a small minority. With the setbacks in America, Prime Minister Lord North asked to transfer power to Lord Chatham, whom he thought more capable, but George refused to do so; he suggested instead that Chatham serve as a subordinate minister in Lord North's administration, but Chatham refused to co-operate. He died later in the same year. In early 1778, France signed a treaty of alliance with the United States and the conflict escalated. The United States and France were soon joined by Spain and the Dutch Republic, while Britain had no major allies of its own. Lord Gower and Lord Weymouth both resigned from the government. Lord North again requested that he also be allowed to resign, but he stayed in office at George III's insistence. Opposition to the costly war was increasing, and in June 1780 contributed to disturbances in London known as the Gordon riots. As late as the Siege of Charleston in 1780, Loyalists could still believe in their eventual victory, as British troops inflicted heavy defeats on the Continental forces at the Battle of Camden and the Battle of Guilford Court House. In late 1781, the news of Lord Cornwallis's surrender at the Siege of Yorktown reached London; Lord North's parliamentary support ebbed away and he resigned the following year. The King drafted an abdication notice, which was never delivered, finally accepted the defeat in North America, and authorised peace negotiations. The Treaties of Paris, by which Britain recognized the independence of the American states and returned Florida to Spain, were signed in 1782 and 1783. When John Adams was appointed American Minister to London in 1785, George had become resigned to the new relationship between his country and the former colonies. He told Adams, "I was the last to consent to the separation; but the separation having been made and having become inevitable, I have always said, as I say now, that I would be the first to meet the friendship of the United States as an independent power." Howe was ordered to institute a naval blockade of the American coastline, but this proved to be ineffective. Howe claimed to have too few ships to successfully accomplish this, particularly as a number had to be detached to support operations by the British Army. As a result, large amounts of covert French supplies and munitions were smuggled to America. The strategy of the British in North America was to deploy a combination of operations aimed at capturing major cities and a blockade of the coast. The British took Long Island in August 1776 and captured New York City in September 1776 in combined operations involving the army and the navy during the New York and New Jersey campaign. In 1777 Howe provided support to his brother's operation to capture Philadelphia, ferrying General Howe's army to a landing point from which they successfully marched and took the city. Howe spent much of the remainder of the year concentrating on capturing Forts Mifflin and Mercer which controlled entry to the Delaware River without which ships could not reach Philadelphia. Three of Howe's ships, the sixth-rate HMS Sphynx, the converted merchantman HMS Vigilant and the row galley HMS Spitfire Galley, bombarded the American troops during the Battle of Rhode Island. Howe then chased the remaining ships of the French fleet to Boston. Not until the fall of Lord North's government in March 1782 did Howe once again accept a command. Despite the suspension of hostilities in America, the war in Europe continued with the same force and the Royal Navy was severely stretched in having to deal with the French, Spanish and Dutch fleets. Howe received instructions from Augustus Keppel, the new First Lord of the Admiralty to proceed to Portsmouth and take command of the Channel Fleet which he did in April 1782. He was promoted to full admiral on April 8, 1782. In September 1782, Howe carried out the relief of Gibraltar. 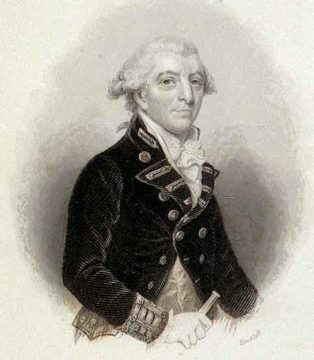 He successfully relieved Gibraltar and then fought an indecisive action at the Battle of Cape Spartel in October 1782, after which he was able to bring his fleet safely back to Britain, bringing an effective end to the naval campaign. Howe became First Lord of the Admiralty in January 1783. On June 12, Gage issued a proclamation, believed to have been written by Burgoyne but distributed in Gage's name, granting a general pardon to all who would demonstrate loyalty to the crown—with the notable exceptions of John Hancock and Samuel Adams. Gage also worked with the newly arrived generals on a plan to break the grip of the besieging forces. They would use an amphibious assault to take control of the unoccupied Dorchester Heights, which would be followed up by an attack on the rebel camp at Roxbury. They would then seize the heights on the Charlestown peninsula, including Breed's Hill and Bunker Hill. This would allow the British to eventually take the colonial headquarters at Cambridge. The colonists were warned of these plans, and seized the initiative. On the night of June 16-17, they fortified Breed's Hill, threatening the British position in Boston. On June 17, British forces under General Howe seized the Charlestown Peninsula at the Battle of Bunker Hill. On June 25, Gage wrote a dispatch to Great Britain, notifying Lord Dartmouth of the results of the battle on June 17. Three days after his report arrived in England, Dartmouth issued the order recalling Gage and replacing him with General William Howe. The rapidity of this action is likely attributable to the fact that people within the government were already arguing for Gage's removal, and the battle was just the final straw. Gage received the order in Boston on September 26, and set sail for England on October 11. Erskine was posted to America in 1776 as a Brigadier staff officer under Clinton, seeing action in the New York campaign and commanding the 7th Brigade at Long Island. In 1777, he was Quartermaster-General to Lord Cornwallis. 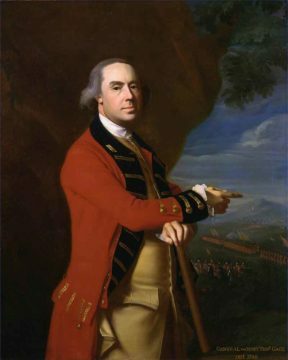 Erskine is credited with advising Cornwallis on the occasion of the Battle of the Assunpink Creek not to put off attacking the Continental Army on the night of January 2, 1777. The Continental forces moved away by night, fighting the Battle of Princeton. 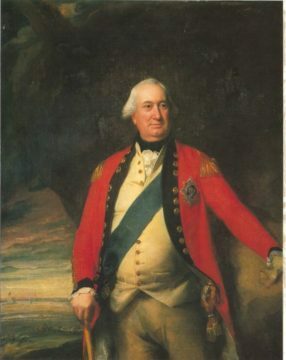 Erskine was made Colonel of the 80th Foot on 4 March 1777. 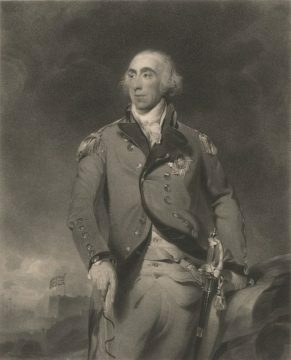 Now a Brigadier-General, Erskine accompanied British forces as second in command under General William Tryon with the assistance of General James Agnew on an inland raid against Patriot supply depots in Danbury, Connecticut. After successfully destroying Patriot supplies, the British forces engaged and defeated Continental Army Generals David Wooster, Benedict Arnold, and Gold S. Silliman and Patriot militiamen in the Battle of Ridgefield. Erskine served in the Philadelphia campaign and then, following Sir William Howe's resignation in 1778, continued as Quartermaster-General under Henry Clinton. 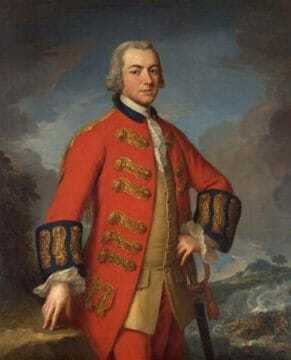 Erskine went on to lead troops at the Battle of Monmouth and after that campaign was given command of the eastern district of Long Island. Erskine's last active duty in North America was commanding five infantry battalions and a cavalry squadron in pursuit of the Continental Army which was thought to be moving to Virginia in November 1778. 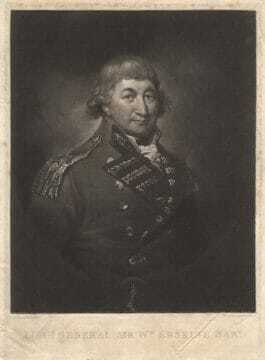 Promoted Major-General on 19 February 1779, Erskine sailed for London the same year. Howe was sent to North America in March 1775. He arrived at Boston aboard the HMS Cerberus on May 25, 1775, having learned en route that war had broken out. Howe led British troops to a costly victory in the Battle of Bunker Hill. He personally leading the right wing of the British attack, with the first two assaults being firmly repulsed by the Patriot defenders. his third assault gained the objective. Howe opted to remain in Boston for the winter and to begin the next campaign in 1776. As a result, the remainder of the Siege of Boston was largely a stalemate. Howe never attempted a major engagement with the Continental Army. He eventually decided to withdraw from Boston and on March 17, British troops and Loyalists evacuated the city. On October 11, 1775, General Thomas Gage sailed for England, and Howe took over as Commander-in-Chief of the British Army in America. On August 27, 1776, Howe attacked the American positions at the Battle of Long Island, starting his New York campaign. After Long Island, they pursued an attempt at reconciliation, sending the captured General John Sullivan to Philadelphia with a proposal for a peace conference. 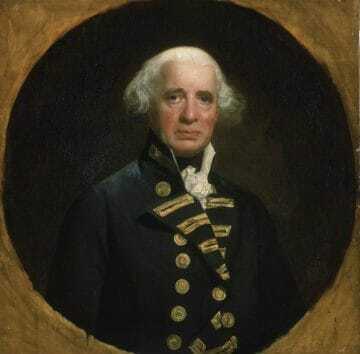 The meeting that resulted, conducted by Admiral Richard Howe, was unsuccessful, and Howe then continued the campaign. He battled at Throg's Neck, Pell's Point, White Plains, and Fort Washington. This ensured that the British took control of New York. Washington then retreated across New Jersey, followed by Howe's advance forces. He recalled the army to positions much closer to New York for the winter. Howe has been criticized by contemporaries and historians for failing to decisively defeat the Continental Army during the New York campaign. When the campaign season opened in May 1777, Howe's underlying campaign goal for the season was the capture of Philadelphia. On September 26, After two weeks of maneuver and engagements (including battles at Short Hills, Cooch's Bridge, Brandywine, the Clouds, and the Paoli Massacre), Howe triumphantly entered the city of Philadelphia. One week after Howe entered Philadelphia, on October 4, General George Washington attacked Germantown. This forced Howe to withdraw his troops a little closer to the city, where they were also needed to help clear the American Delaware River defenses, which were preventing the navy from resupplying the army. It was late November before this task was accomplished, which included an attack on Fort Mercer by a division of Hessians. 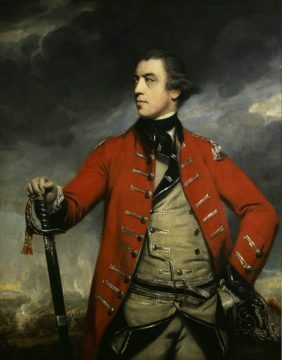 Howe's poor campaign planning contributed to the failure of General John Burgoyne's Saratoga campaign. Burgoyne's surrender, coupled with Howe's near defeat at Germantown, dramatically altered the strategic balance of the conflict, and the victory encouraged France to enter the war against Britain. In October 1777 Howe sent his letter of resignation to London, complaining that he had been inadequately supported in that year's campaigns. He was finally notified in April 1778 that his resignation was accepted and he resigned his post as Commander in Chief, North America. On May 24, Howe sailed for England. Back at England, Howe was at times active in the defense of the British Isles. He sat in the House of Commons from 1758 to 1780. In 1780, Howe lost in his bid to be re-elected to the House of Commons. In 1782, he was named lieutenant general of the ordnance.